Jack Frazier Estate 2-Day Auction (Day 2) — Harritt Group, Inc.
88 Acre farm including home and outbuildings offered in 2 tracts. Also selling farm antiques & collectibles, farm related items & scrap and household items. A lifetime accumulation of tractors & implements, farm & machine shop equipment, welding & power equipment and tools. All buildings are packed full, be ready for lots of surprises. Beautiful 88 Acre Clark County farm with open fields, tillable acres, woods and ponds selling in 2 tracts including ranch home and outbuildings. Also selling 2 full days a lifetime accumulation of tractors & implements, farm & machine shop equipment, welding & power equipment, tools, farm related items & scrap, country antiques, collectibles and household. Auction located off Hwy. 160 just 3 1/2 miles North of Hwy. 403 and 20 miles NE of Louisville, Ky.
Fresh to the market a beautiful secluded 88 acre Clark County farm with a 1960’s Bedford stone ranch, detached garage, barn with lean-to, pole barn, corn crib and several sheds. Selling individually and then combinations using the multi-par method. Bedford stone 800 square foot 3 bedroom-1 bath ranch plus full unfinished basement built in 1966, 26’x38’ detached garage, 12’x49’ pole barn and sheds on 2.75 acres with 138’ road frontage. Home features hardwood floors, central air & heat, woodstove, replacement windows, recently replaced roof & outside entrance to basement. 85.3 peaceful rolling acres with 50+- acres tillable, woods, 2 ponds, 50’x50’ barn with lean-to, 24’x26’ corn crib, 88.46’ frontage & 16’ access easement. 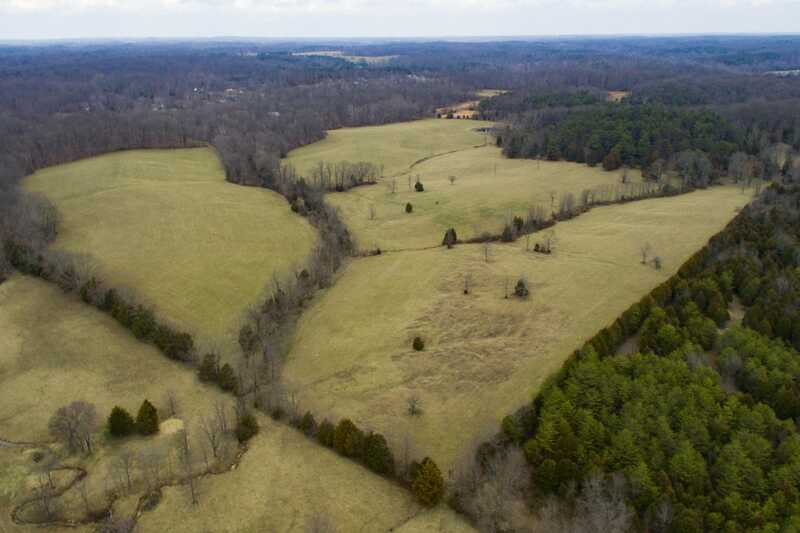 This tract includes a 74.25 acre square of secluded farm and recreation land. 10% non-refundable down payment due day of auction, balance in 40 days. Seller to pay 2016 due 2017 real estate taxes, buyer to assume all subsequent taxes. Possession immediate upon closing. **Property taxes are subject to change annually. (2) Large industrial wire cages, chicken feeders, (3) old floor corn shellers, 200 gallon diesel tank with fuel, old LP tank, culverts, metal lockers, old seed grader, old oil tanks, old utility trailers, platform scale, galvanized barrel, Berkel meat slicer, rough cut lumber, as-is pull vintage camper, old mill grinder, large selection of yard tools, horse drawn plows & entire contents of barn & corn crib, log chains, blacksmith forges, fencing, large selection of scrap iron and more. Should be some surprises. (2) Metal retro rotating nail bins, metal lockers, oak US Postal 10-drawer cabinet, 5-gallon Standard Oil cans, vintage oil can collection, Bluegrass galvanized buckets, wash tubs, wood boxes, pitcher pump, Tri-State Butter Co can, railroad switch light, hand crank corn meal grinder, coal buckets, stone crocks, small brass steam whistle, old brass horns, cast iron dinner bell, barn lanterns, blue jars, banjo, mantle clock, cast iron store scale, cast iron implement seat, wood pulleys, corner brace and bit, traps, porcelain butcher scale, old axes & hatchets, sprinkling cans, industrial cabinets, vintage fishing nets, wooden sled, vintage school desk, aluminum kettle, iron kettles, iron wheels, croquet set, wood tool caddies, wood floor radio, 8’ iron industrial base, cross cut saws, minnow buckets, service station bell, banjo, old violin, marble top dresser, metal trunk, presidential pocket knives, advertisement tins, Lionel Pennsylvania train set – new in box and more. Oak clawfoot pedestal table and 4 chairs, homemade corner china cabinet, washer and dryer, Maytag wringer washer, sofa, recliner, cedar chest, pots and pans, china, glassware, linens, gun cabinet and more. From Hwy. 31 Sellersburg or Hwy. 3 Charlestown take Hwy. 403 to Hwy. 160. North 3 1/2 miles to right on O’Possum Trot Road. 1/2 mile on right.